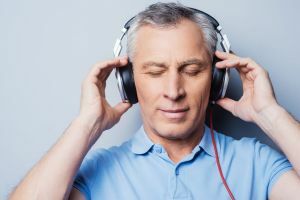 Thanks to recent advancements in hearing device technology, millions of people with hearing loss are able to hear their favorite sounds and enjoy conversing with their favorite people. One perk this new technology affords users is compatibility with other personal electronic devices, such as smartphones and televisions. Sometimes, as in the case of headphones and earbuds, finding the right listening combination can be a bit tricky. Which headphones will work with my hearing aids? With all of the different headphones on the market today, which ones work best with hearing aids? That all depends upon what type of hearing aids you wear. Here are a few things to consider before you discuss the subject with your hearing healthcare professional. Finding good fitting headphones when you wear devices which fit inside the ear canal is a lot less problematic than it is with other models. Invisible-in-the-canal (IIC) hearing aids and completely-in-the-canal (CIC) hearing aids are the tiniest hearing aids on the market. Their ability to fit inside the ear canal make them more discreet than other models. These devices are usually prescribed for those with mild or moderate hearing loss. In-the-canal (ITC) hearing aids sit in the lower portion of the outer ear bowl, which makes them comfortable and easy to use. Because they are slightly larger than IIC and CIC hearing aids, they have a longer battery life and able to address a wider range of hearing losses. Low profile hearing aids sit inside the ear, although range in size from half shell designs to those which fill almost the entire ear bowl. Because they are larger and easier to handle, they may be more desirable for those with dexterity issues. Since all components of the above devices fit completely inside the ear canal, they are usually compatible with on-ear or over-the-ear headphones. Those who wear IIC hearing aids may even be able to use earbuds. Those who wear BTE or receiver-in-the-canal (RIC) devices may find over-the-ear headphones the best option. BTE hearing aids range in size from mini BTEs with ultra-thin tubing to those which work with earmolds to address severe to profound hearing losses. RIC and receiver-in-the-ear (RITE) hearing aids have the speaker built into the ear tip instead of the main body of the hearing aid. When using headphones with these hearing devices, choose a model which fits completely over the hearing aids’ microphone, which is located outside the ear canal and behind the ear. If it doesn’t fit completely over, the hearing aid will pick up external sound instead of what is coming from the headphone. You may have to try a few models to find the right fit. The key is to make sure the headphone speakers are located far enough away from the hearing aid microphones to prevent problems with audio feedback. If you’re still having trouble finding headphones which work with your hearing aids, make sure you’re using the hearing aid program for the listening environment. A program which emphasizes speech may not be the best one to use when you’re listening to music or audiobooks. If you’re in doubt about which program to use -- or how to switch between programs on your hearing devices -- ask your hearing healthcare professional for assistance. To prevent additional noise-induced hearing loss, make sure you follow the 80-90 rule when using headphones or earbuds, regardless of whether or not you wear hearing aids: listen at 80 percent or less of your device’s volume for no more than 90 minutes a day. As always, if you find you’re not hearing your best, schedule an appointment with a hearing healthcare professional for a thorough evaluation.